Limitless is more fun than it ought to be. With an idea as trite as a drug to access the hidden potential within your own head, this ought to have either been a painful super-hero movie or a morality missive about the pros and cons of meddling with nature. In fact it is neither. Instead, it is an absorbing caper, sort of a crime thriller, that has just the right mix of twists and turns. Eddie Morra (Bradley Cooper) is a wannabe writer, with a severe case of being an abject failure. He is spineless, racked by issues of self-esteem, and is a mute spectator watching his life spiral down the drain. When his gorgeous girl-friend Lindy (Abbie Cornish) leaves him in what can only be described as a subdued break-up, Morra has hit rock bottom and does not even know it. Which is when he meets his drug-dealing ex-brother-in-law Vernon (Johnny Whitworth), who slips him a transparent pill, that is supposed to allow Morra to access his brain's full potential. The pill, called NZT, does all that it is supposed to do and more. Not only does it open him up to his own mind, it also opens his life up to a series of seedy characters - who either want to take advantage of him or steal his acquired stash of NZT. There is Carl Van Loon (Robert De Niro), the ruthless multi-billionaire who is Morro's one shot at monetizing his newly acquired capabilities. Gennady (Andrew Howard) is Morro's seed capital for when the latter begins to use his new-found prowess in the stock market. And finally there is the mysterious man in the tan coat (Tomas Arana), who seems to know everything about NZT and is determined to do everything in his power to steal some. The characters have a healthy dose of the familiar characteristics. The thug is thuggish, the billionaire is ruthless, the girlfriends are supportive yet oblivious and the ex-girlfriends are mysteriously shy. Yet, played by a well chosen cast, this quickly gets the introductions out of the way, keeping the focus firmly on the unfolding story. And it is an interesting story. In the high of NZT, Morro makes new friends, money and enemies. While he is still sorting out which is which, he realizes that the drug does have a side-effect, massive blackouts and unbearable withdrawal symptoms. While the plots to obtain his stash materialize, Morro realizes that he is counting down to madness or death. The screenplay is light and quick, never getting too bogged down by the story. This leaves enough ends unresolved, that is both annoying and intriguing. The visuals are well suited, one particular effect is the difference between pre and post NZT ingestion, as the world perceptibly brightens from a dull dinginess. Or the zoom in effect as the lens travels through New York - a bit different from the other ways this has been done before. The visual cues are reinforced by the sound track that is quick and pacey. Bradley Cooper's self effacing commentary is spot on, setting the tone for the rest of the movie. Robert De Niro is as rugged as only he can be. Except for maybe Michael Douglas. While this is not intellectual thriller extraordinaire, the characters make the tale convincing. Limitless - is the number of ways this story could have been messed up. 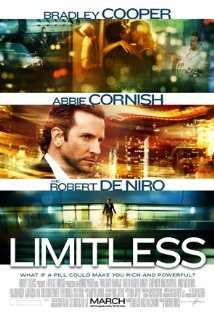 Thankfully, in choosing to be limited, Limitless was way more fun than it ought to be.